In an increasingly digital world, St. Velotine’s Day is our emerging tradition celebrating all-analog affection. Next Wednesday, February 14th, the Cycling Center will be using our bike shop as a one-day pop-up couriering agency dedicated to appreciation and positive community spirit. Now through February 14th at 12:00pm*, you can stop in at our bike shop and order a velotine for a $10 suggested donation per velotine. On St. Velotine’s Day, volunteer bike couriers will deliver your velotine by bike. Has an organization done something exceptional that you want to cheer in a way that no mere email could convey? Does a neighbor give great high fives? Could a friend use a little moral boost? Think of someone—a person or an organization—to send your velotine to. Who are you thankful for? Who do you love, respect, or admire? Who could use some positive vibes? Stop into our bike shop (1700 NE Alberta St., 10:00am-6:00pm) and ask any staff member for a velotine form. Write down your message and delivery details, and give your donation ($10 suggested). Deliveries need to be within the city of Portland. Before delivery day, we’ll type up your message using a mid-century Olympia manual typewriter (I know!) on a snazzy velotine. On February 14th, our crew of bike couriers will deliver your note with a smile. Would you like to make a whole bunch of people smile while either typing on a vintage typewriter or serving as a volunteer bike courier? Doesn’t that sound like gaggles of fun? Sign up to be a veloteer typist and/or courier! >> Sign up to be a veloteer typist and/or courier! Remember to order your velotine by 12:00pm on February 14th* at the Community Cycling Center Bike Shop. Thank you for sharing the bike love! 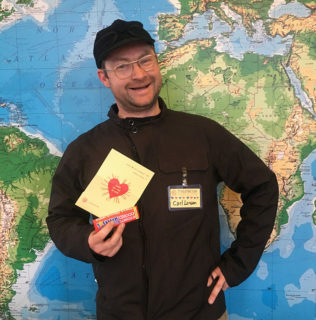 Many thanks to Tony’s Chocolonely, PDX Typewriters/Ethan Jewett, and Betsy Lance for making St. Velotine’s Day possible. * If your velotine is to a business and must be delivered by 5pm or earlier, please order your velotine no later than 5pm February 13th.